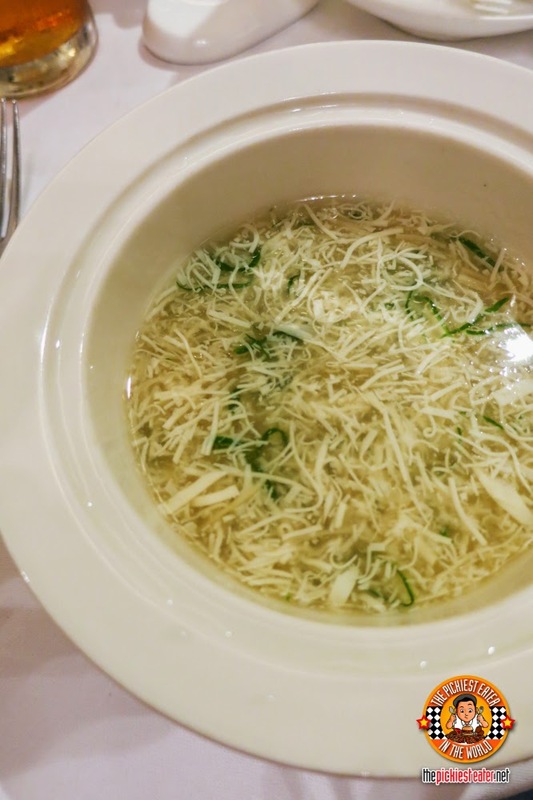 Just to give a quick background, Huaiyang cuisine is considered to be one of The Four Great Traditions in the culinary heritage of China (Others are Cantonese cuisine, Shandong cuisine and Sichuan cuisine.) That's why it was such a pleasure that we were able to try it. 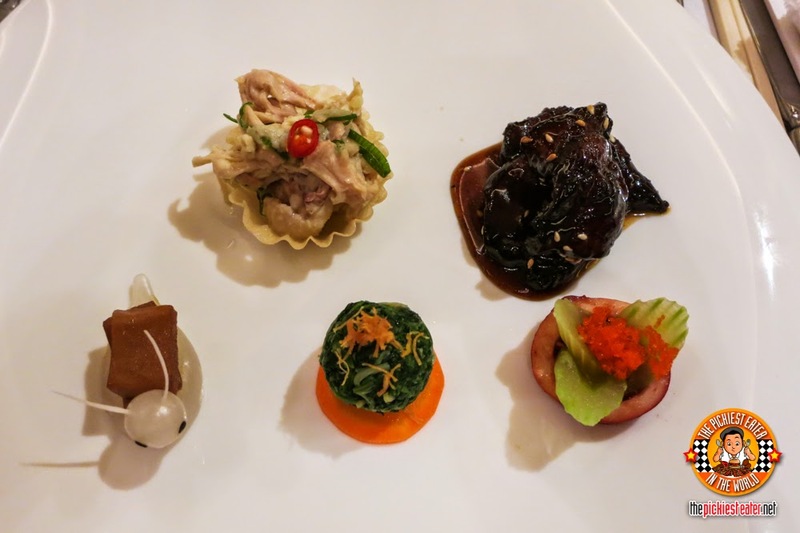 Starting with this Appetizer Combination in Jiangnan style which includes Marinated Chicken and Sliced Abalone with Wasabi ( top left) I loved this one. Very fresh and had a mix of different textures. Next is the Deep-Fried Fish with Five Spices (top right) which is also one of my favorites! Love the sweet sauce it was covered in! The Marinated Minced Spinach with Green Mustard (bottom center) was too hot for my liking. Once I popped the WHOLE THING into my mouth (nig mistake), I felt flames run up my nose hehe. But then again it depends on your heat tolerance because some of our seat mates loved it! The Marinated Cuttlefish and Japanese Bean Curd (Lower far right) was okay as well. I thought at first that it was squid. Chewy! And last but not the least is the least is this very cute looking snail! 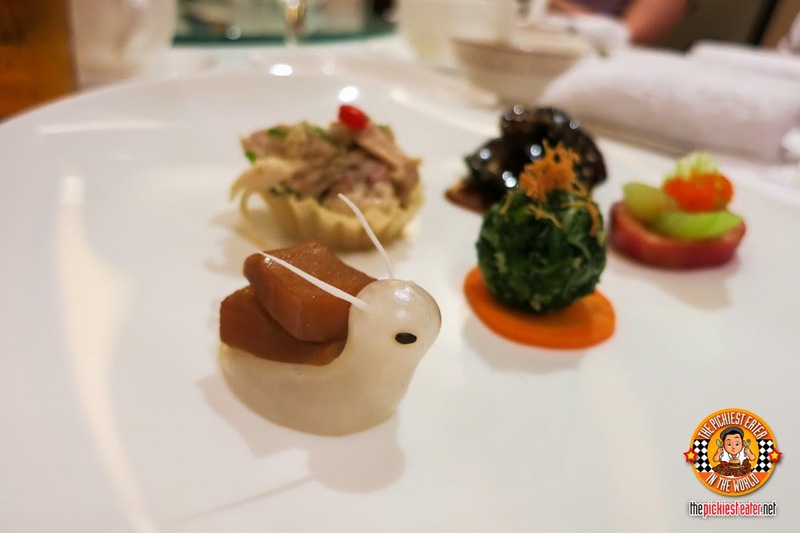 The Stewed Snail with Garlic and Chili Sauce which Chef Anthony creatively presented as a cute little snail! His creativity is really evident in these appetizers don't you think? Tip! I ate the snail chunks with the remaining sauce of the Marinated Chicken and Sliced Abalone with Wasabi. And it was good! 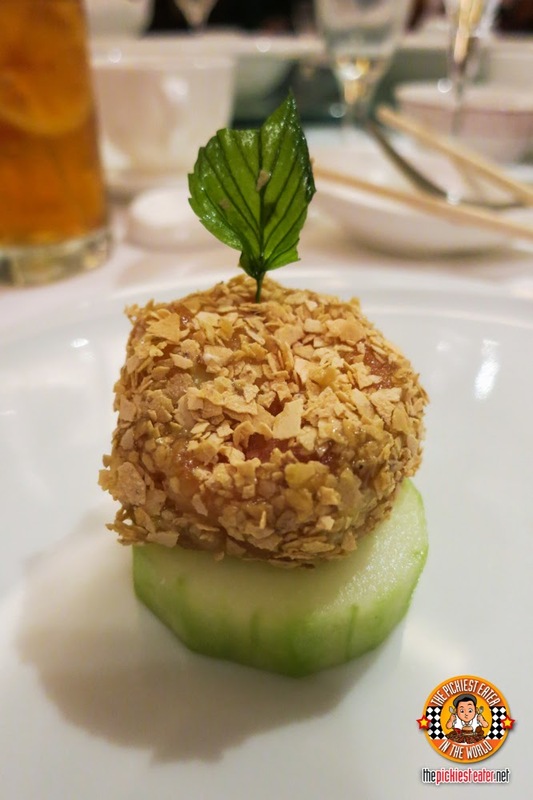 To warm our tummies, we were served the Braised Bean Curd Ball in Superior Broth. At first I thought the strips were noodles. But they're actually expertly-sliced bean curd in this thick creamy and hearty soup! It was my first time to try something like this. Next is my favorite. The Deep-Fried Shrimp with Oatmeal. 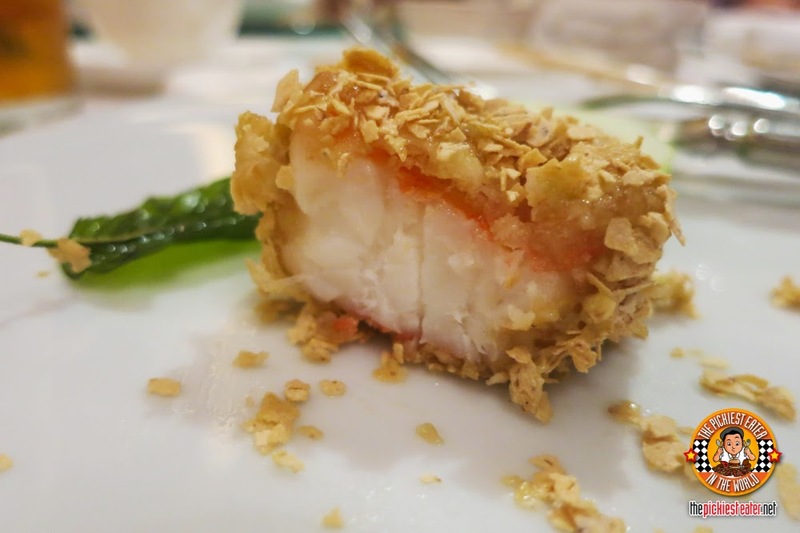 Huge tender shrimp inside with a bit of wasabi mayo, and then coated with crunchy oatmeal, all sitting on a thick slice of cucumber. I'm so happy Richie doesn't eat shrimp so naturally he gave me his share bwahahahahaha! *Evil laugh*. Here's a cross-section shot. I could eat 3 of these. No, maybe like 4. Or 5. There it is!!! It's inside! Funny that it's only now that I'm wondering how Chef Anthony stuffed the meat inside the pear. Because I had to slice that pear open and I don't recall seeing any opening. Mind-blowing! Hats off again to the Chef! Oh, and plus the meat? Soooo soft! 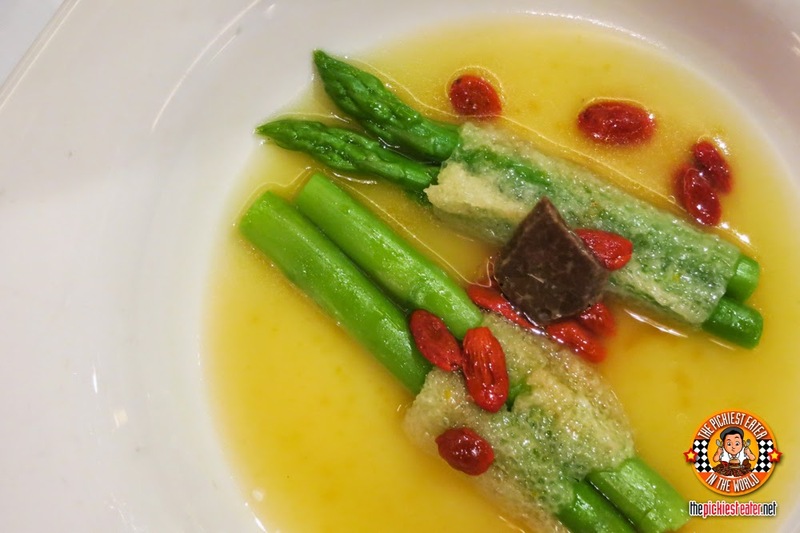 Next is the Braised Bamboo Asparagus in Superior Broth. 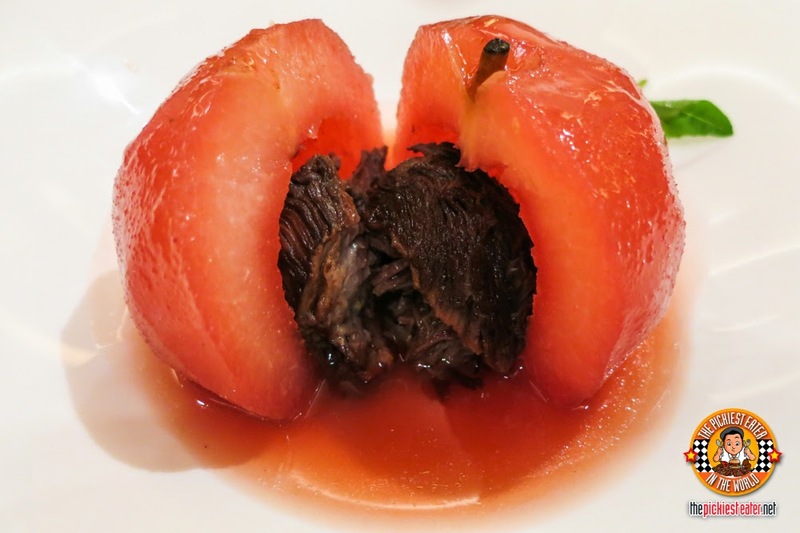 This is a very light and refreshing dish with hints of sweetness from the goji berries. The bamboo pith added another texture with its spongy-ness. A great dish for vegetarians! 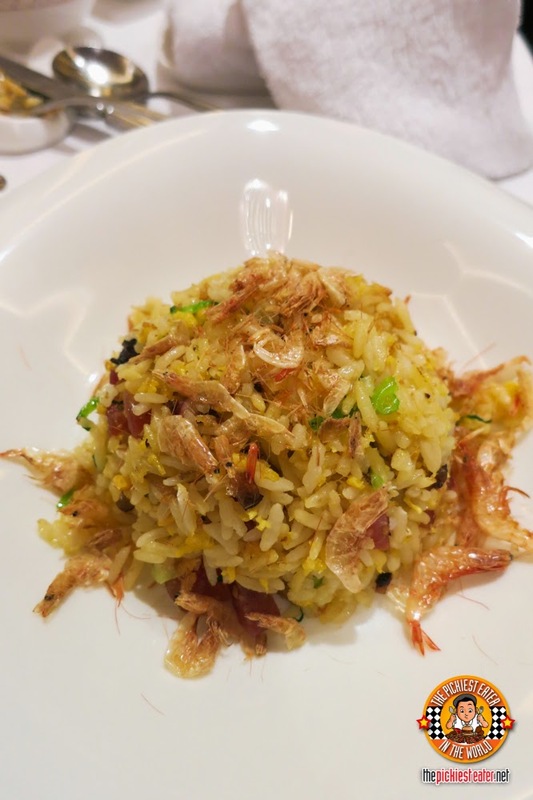 The Fried Rice with Preserved Meat and Shrimp was really delicious. Very tasty and the crispiness of the dried shrimp added more fun! It's one of the few shrimp dishes that Richie, The Pickiest Eater, ever devoured in his life. Hehehe. 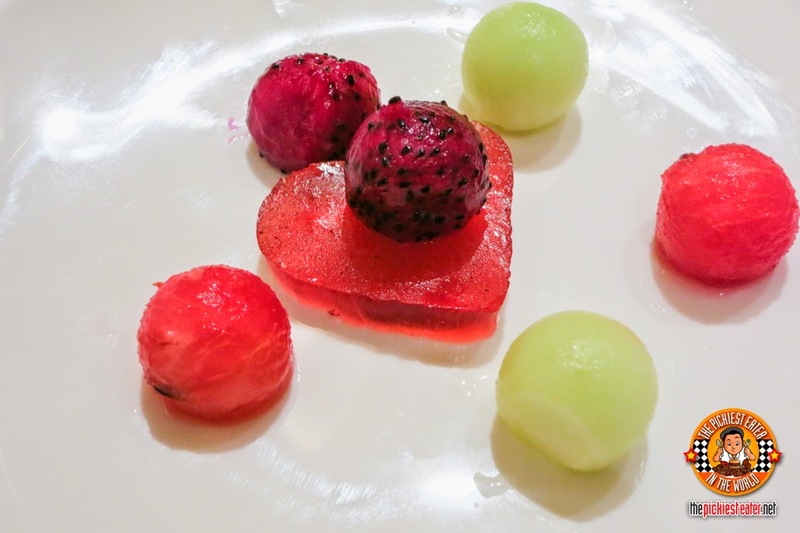 And for our sweet ending, a plate of assorted fruits, and a piece of jelly heart. Simply fresh, simply healthy, simply delicious. 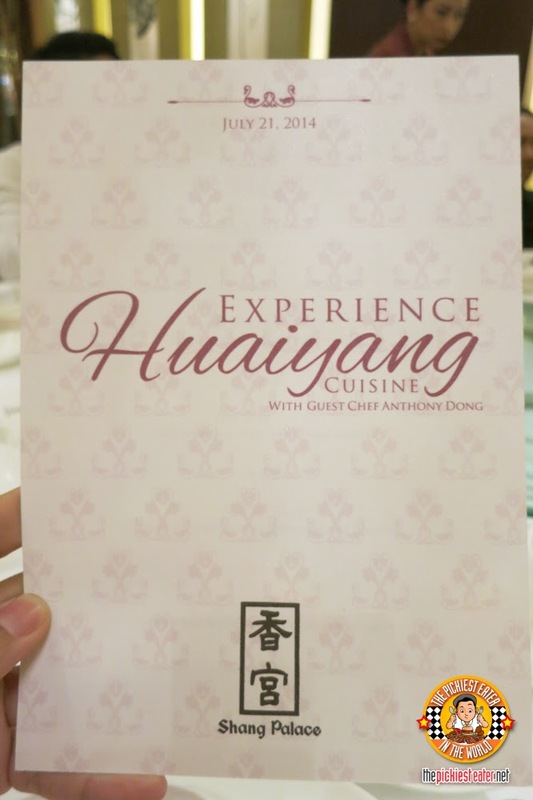 It's no wonder that Chef Anthony Dong carries a big name in the culinary industry! 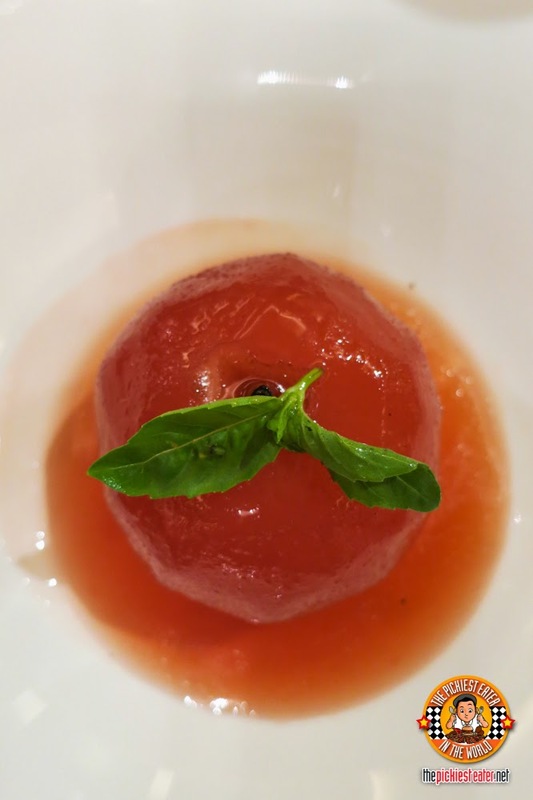 You can really taste and see how he pours his heart when he creates his dishes! 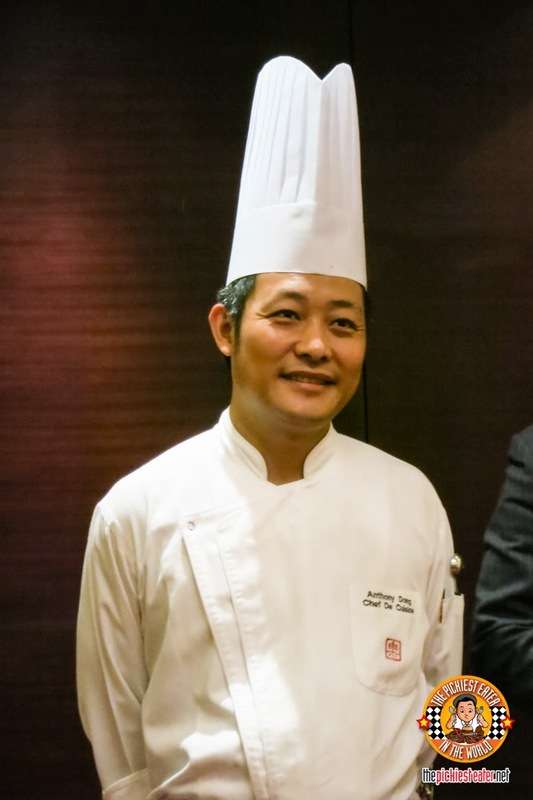 It was a pleasure, Chef Anthony! Thank you! 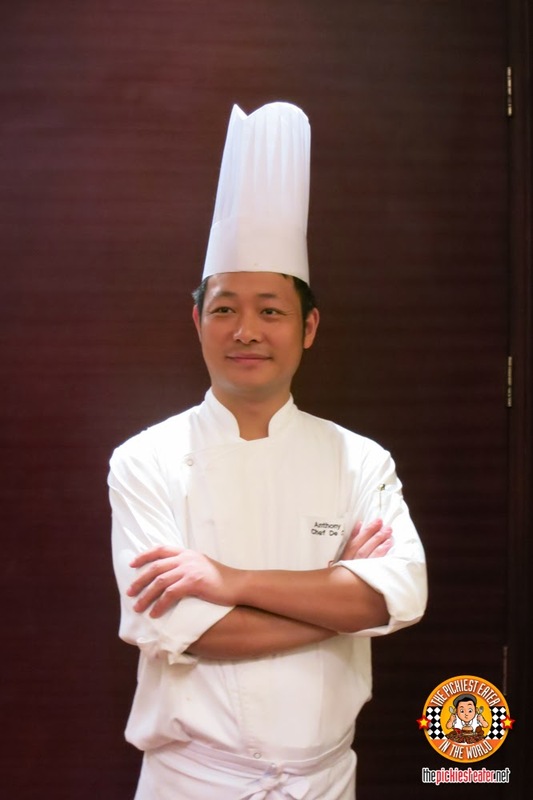 The Huaiyang Cuisine started last July 20 and will end on the 30th of July 2014, only at Shang Place. 2nd floor of Makati Shangri-La along Ayala Avenue corner Makati Avenue, Makati. Thank you once again to Mica, Chrystel, and Lesley for having us! For more information, like Makati Shangri-La on Facebook , or call (02) 813 8888.